Cardinal Joseph W. Tobin has a soft spot in his heart for the men and women who have dedicated themselves to God and the Church in religious life. He himself did this as a young man when he joined the Congregation of the Most Holy Redeemer (Redemptorists), later served as the superior general of that worldwide order, then helped guide the life and ministry of the Church’s more than 1 million religious as the secretary (second in authority) of the Vatican’s Congregation for Institutes of Consecrated Life and Societies of Apostolic Life. So it’s not surprising that the leaders of religious communities based in central and southern Indiana were grateful for Cardinal Tobin’s leadership in the archdiocese over the past four years, elated to learn that Pope Francis had selected him as a cardinal and sad when they heard that he had been appointed to leave the Hoosier state to lead the Archdiocese of Newark, N.J.
She saw this support on display in the first visit that Cardinal Tobin made to her community’s motherhouse, which is northwest of Terre Haute. She understands the choice of Pope Francis to have him lead the Church in northern New Jersey, but is sad about it, too. Cardinal Tobin took a retreat at Saint Meinrad Archabbey in St. Meinrad shortly before he was installed as archbishop of Indianapolis on Dec. 3, 2012, and was at the monastery when he learned via Twitter on Oct. 9 that Pope Francis had selected him as a cardinal. 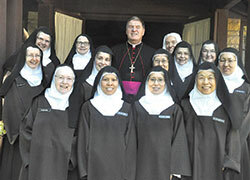 Benedictine Archabbot Kurt Stasiak, elected the leader of the archabbey in June, appreciated Cardinal Tobin’s close connection with his community. Franciscan Sister Maureen Irvin, congregational minister of the Oldenburg-based Sisters of St. Francis, valued Cardinal Tobin’s connecting of faith to care for the environment, a priority shared by her community. Sister Maureen also sees a message in Cardinal Tobin’s acceptance of God’s will in his own life, even when it presents difficult, unwanted challenges. Discalced Carmelite Mother Anne Brackman, prioress of the Monastery of St. Joseph in Terre Haute, leads a small community of cloistered nuns dedicated to a hidden life of prayer for the Church and the world. As active as Cardinal Tobin has been in serving the faithful in central and southern Indiana and the broader Church around the world, she said she and her community feel shaped in their life and prayer by the witness of Cardinal Tobin. Mother Anne added that Cardinal Tobin for her community is “a man who inspires us to be welcoming and accepting, to look beyond our local Church to the world and its needs, especially now as the world grapples with the millions of refugees and immigrants. Conventual Franciscan Father James Kent, leader of the Mount St. Francis-based Province of Our Lady of Consolation, recalled with joy the many times that Cardinal Tobin visited him and his friars in southern Indiana. One was a Franciscan brother who had taught as a lay Catholic at Holy Redeemer School in Detroit when Cardinal Tobin served as associate pastor of the parish. While losing an archbishop with such an approach to pastoral leadership is not easy, Father James is focusing on gratitude for Cardinal Tobin’s four years leading the Church in central and southern Indiana. “What a gift this shepherd has been to so many,” he said. “His legacy is rooted in the seeds he planted that will bear fruit well into the future, all at the service of the Lord. Benedictine Sister Jennifer Mechtild Horner was elected prioress of Our Lady of Grace Monastery in 2015. She, too, is grateful for Cardinal Tobin’s valuing of the life and ministry of women religious and the time he spent with her community. Sister Jennifer said that following Cardinal Tobin’s leadership and witness of faith will be a challenge for the faithful of central and southern Indiana, but one that can be achieved with God’s help. “Cardinal Tobin leaves a great legacy, and we must ask for the grace to carry it forward,” she said. “Called to reach out to the poor, we will need to continue to look for ways to serve the poor so that no one is excluded or left without what they need. “We will need to look for ways to continue his call to dialogue as we look to build bridges that will allow those with differing opinions to talk with one another. We will need to call each other to a way of acting that is different than the world’s way.